Alexis Nunez is a mysterious man. 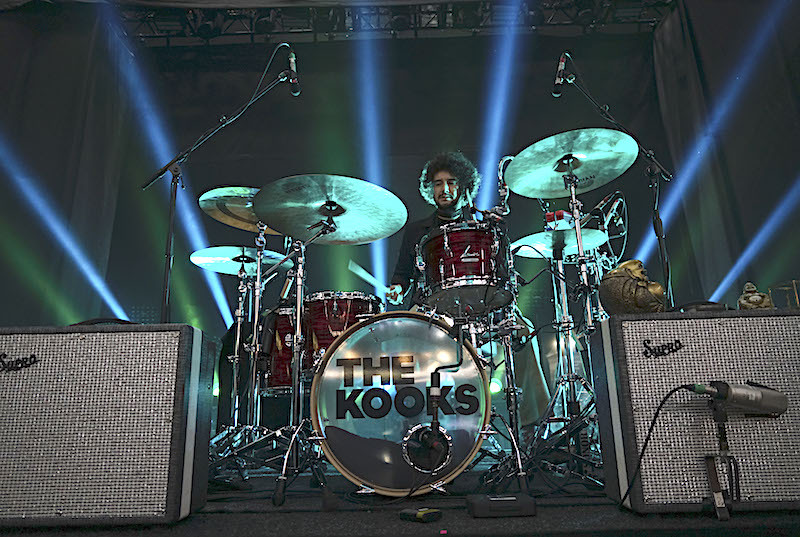 Google, Facebook and most other corners of the World Wide Web don’t give much away about the young London born drummer – despite him being a regular on the worlds biggest stages. Having started his professional drumming career over a decade ago, Alexis toured and recorded for a variety of bands over the years. His journey reached a new level when joining Britpop sensation The Kooks in 2012. Taking over from Paul Garred, who had to leave the band due to health reasons, Nunez not only replaced a drummer but filled the gap in the line up so well that he celebrated the bands 10th anniversary this year. And there is only more to come. 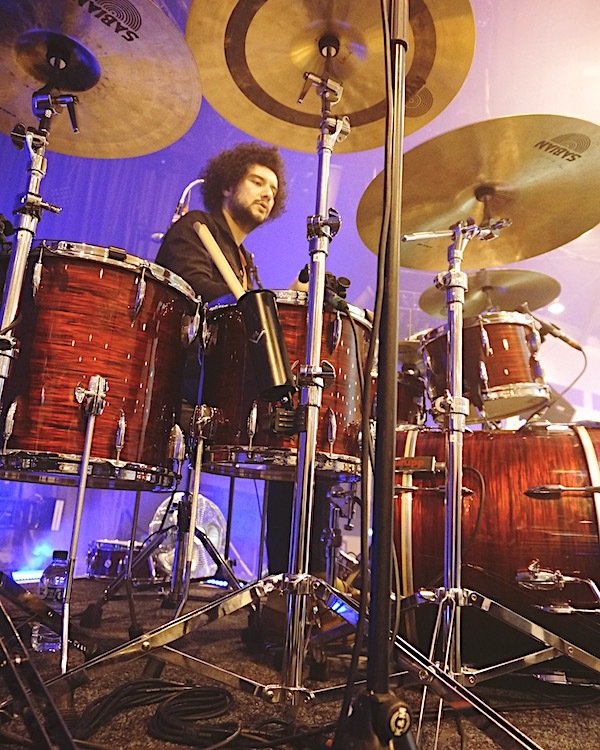 I caught up with Alexis, accompanied by his 10 year-old daughter Lucille, at the UK Drum Show to talk about his upbringing, his way onto the Kooks drum chair and his work towards a solo album. You are London born but your family is from Chile. Has South American music been an influence to you when growing up? No, from what I can remember the music around the house that my parents were listening to was very versatile. I remember driving around in my mums car and she used to play quite a lot of contemporary pop stuff. This is the 80s so I remember hearing Simply Red and things like that. In terms of having a musical influence when I was a kid, it was really my dad who was very influential. He is a big Frank Zappa fan, so from when I can remember I was hearing all these crazy records from the ’60’s, ’70’s and onwards. That combined with a lot of blues. I also remember hearing a lot of fusion music from the ’70’s; which is something I really picked up on later on when I actually started playing. It was all very varied. My dad is a big music lover and always played a bit of keys, guitar and bass, so there were always instrument around the house. He was always very encouraging and got me started on violin when I was five. After that I did two years piano but then decided to kick that all in. 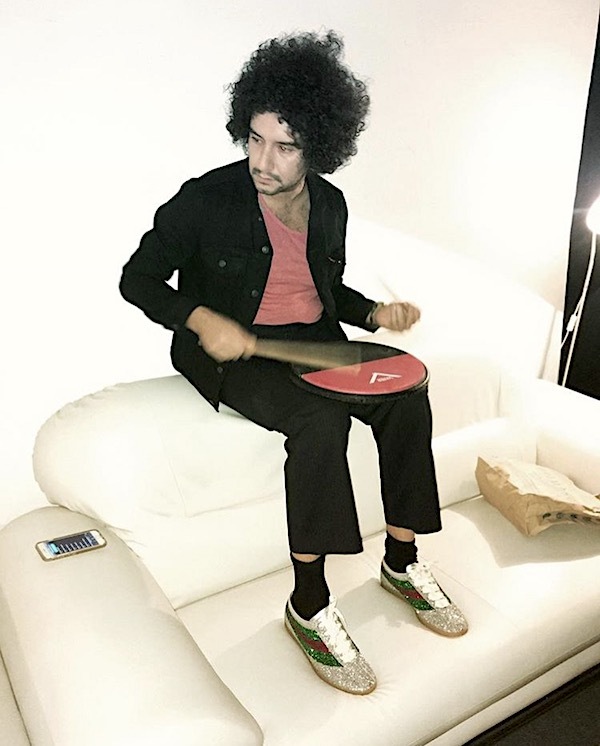 I started wanting to play drums when I was about 12, and it was then that the music that I’d been listening to as a kid (and didn’t understand then) became more interesting. I started going through my dads vinyl collection and found ‘Heavy Weather’ by Weather Report. That album just… ah man…something happened and the more I hear it the more I realised how incredible it is. It was at that kind of age (13/14) were you’re just open and getting to know what you’re about. That started a big love of jazz: I started listening to more fusion music and then went back to Miles Davis and all these sorts of things. Did you have any drum lessons growing up? Yes, I had drum lessons at school for half an hour every Friday with a guy called Tom Meadows who plays with Kylie Minogue, Duffy and many more. I actually bumped into him yesterday. It was great and we immediately became good friends and would hang out. I remember coming out of his lessons super happy and excited and would just be running home to try to learn what he had given me. That was my first education as such on the drums but from there I didn’t really do much. I went to the jazz course at the Royal Academy for a year but it didn’t really work out. Only over the last few years now I’ve been getting lessons with a guy called Pete Zeldman, who’s a genius! Was it a conscious decision to make drumming your job? Your first pro band was the Golden Silvers? Yes absolutely. I went to school with a guy called Gwilym Watkins, he’s Gwilym Gold now, and he started the band (it was a trio) to play his music round about 2007. That was the first kind of big thing. We got signed to XL Recordings, started touring, released an album and all that. 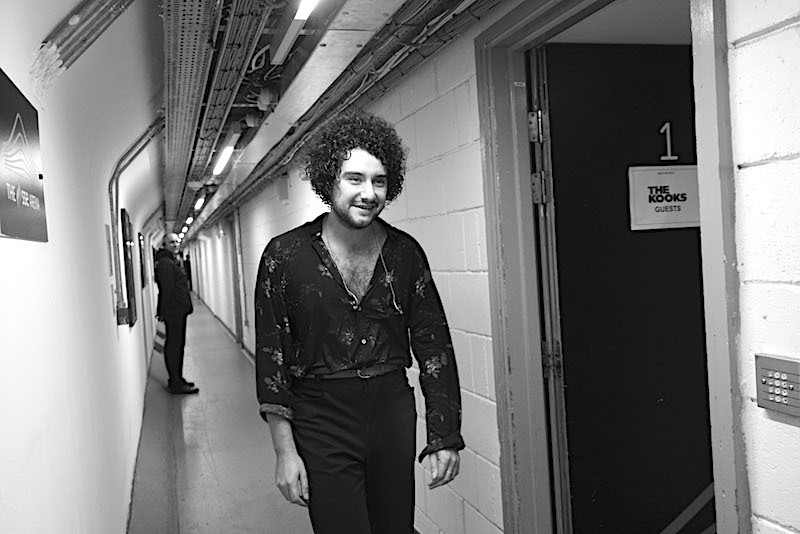 And then The Kooks just stole you away? Yeah. The Golden Silvers went on for about two years and after that I just carried on playing around London. I was always doing all kinds of different things throughout the years: different types of music, keep an open mind and try to play with as many people as possible. For about a year or two I played with I Blame Coco and after that had a band with a few friends of mind called Hejira. At that time I got a text message from Luke Pritchard, the singer of The Kooks. He said he got my number from a mutual friend because they needed a new drummer and asked if it was something I might be interested in. Of course I was interested! We met up the next day for a drink which was great. I learned a few of their songs, we met up with the band and I just did what I did. A few weeks later I got a call saying they were really happy and wanted to get me on board. I had to learn about 25 songs, they flew me out to Boston to rehearse for about two days and it was all straight in after that. All of that happened in 2012. You started as a session player but then very quickly got offered the seat? Yes exactly. When I initially joined it was with the view to officially become a member but we first wanted to see how it goes, how we get on when we tour and all that. Seems I managed to sort of fit in there. Was it weird to join a band which had been together for so long? After all you’re not just replacing a drummer but also a good friend. Yes absolutely. It wasn’t difficult to step in and play the music, but what was kind of strange was that the original drummer had some medical issues, so he had been in and out of the band for a few years until I came in. During that time they had a lot of different drummers sitting in which had been quite stressful for everyone involved. One thing I did pick up though listening to the live recordings with him was the dynamic he had with the band, how the band sounded with him, certain fills that I still play just to glue it all together. Luke (lead singer of The Kooks) said you brought a very funky, ‘Prince-like’ influence to the band. Did you put that stamp on it consciously or is that just the way you play? Oh man, Prince is one of my heroes! That guy is just too much. I absolutely love him! That’s just me. It’s something I could do. I love funk music. Period. I guess it was just an aspect of my playing that just came out of me in the studio when we were jamming and the guys kind of picked up on it. You guys have just done the 10 year anniversary tour last year. Yes, we just released an album called “The Best of… So Far” and have been touring that recently. We had our London show at Alexandra Palace which was really cool. It was the biggest show the band had ever done. We’re just about to go to L.A. to finish tracking for the next album, which is almost done. That will be out early spring 2018 and will probably take us straight into the next campaign. So yeah, the next few years look pretty solid. Sounds like a busy year ahead! Let me ask your daughter a question: Lucille, how is it having dad who’s a drummer? Lucille: I kind of got used to it now because he tours quite a lot. It’s easier for me now when he goes away because I know he comes back. Alexis: And I always come back with presents! It can be very tough. I always say anything over one month gets really tough. I’ve been lucky in a sense that we’ve only gone over a month once or twice, there mainly is a lot of back and forth. During the long stretches you obviously miss the family a lot. We’re Skyping and Facetiming every day though. Rosie, my girlfriend, just gets so tired of me calling all the time. Lucille: He does. He calls so much every day. Alexis: [laughs] It’s touring though, there is a hell of a lot of waiting around. For me the reason I do call is to get a burst of energy. It’s a ‘OK, I’ve spoken to the kids, spoken to the family, I can carry on’. As long as I have that connection there, it keeps me going. It can be tough though – especially when there is 12 men on a tour bus every night. Sometimes you just wanna go home. Do you have any time to work on anything else? Yes, I actually have a studio in East London that I share with a few friends. So I’ve been doing some writing, production and learning how to use the studio as a playground. I’m learning more about mics, outboard gear, pre-amps and all that sort of stuff. I’m really getting into that now. There is a lot of money to be spent on that stuff, it just never ends. It’s a lot of fun. Particularly the writing! I’ve always played drums for other people and loved the immediacy of just playing but it’s nice to be able to sit down and start writing. Do I sense the idea of releasing a solo album there? Absolutely. I’m writing some music with a friend of mine and we actually got quite a few songs together now. It’s great! I mean it’s an absolute lope but in this day in age you can just bring out an album, can’t you? I’m looking forward to hearing that! Is that more down the jazzy aisle then? Erm, no actually. Songs. Actual songs. The guy I’m doing it with is a very old friend of mine so it’s sounding a lot more like ’70’s stuff. I mean there are a lot of influences but they’re all songs. There is no 12 minute 7/8 sections or stuff like that. In the future I definitely want to play and write more instrumental music though and get back to the jazz roots, because it’s something that’s still in there. It’s just been put aside for now. 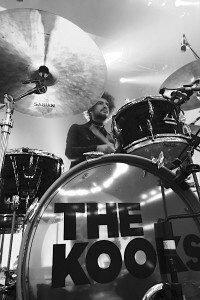 You do write with The Kooks as well though, right? So do you have your creative input? Yes. Particularly on the fourth album ‘Listen’, which was the first one I was on, we had some really good sessions where we were just running around the studio bouncing off ideas. This time around, for the upcoming album, Luke has done a lot of the writing. He’s been working with a producer, so it will be more of me coming in for tracking and adapting but I’m confident there’s gonna be some room ideas. We’ll find out in LA. In early January we’re touring Australia, which is always a lot of fun. 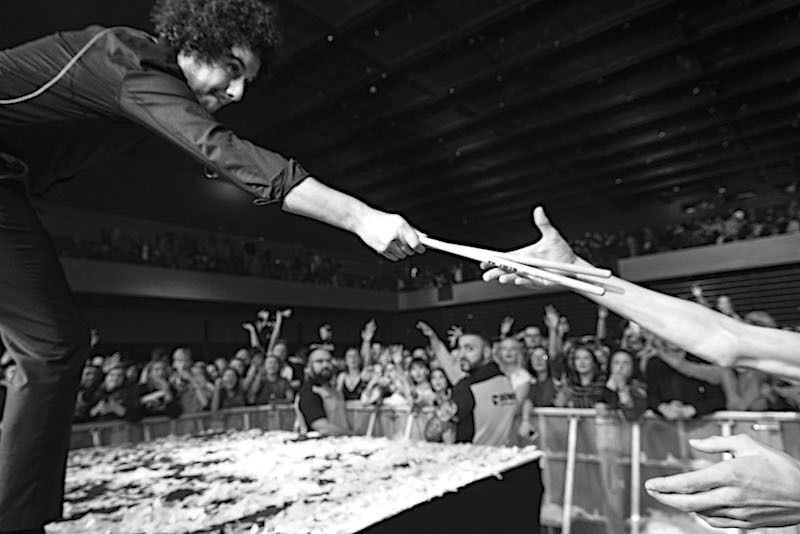 We’re also playing three shows in Dublin and two in Tel Aviv before having some time off. After the little break we’re heading out to tour South America and the US. Thanks a lot for your time Alexis!